rodpedersen.com: DUB ROUND-UP, WARRIORS WIN AGAIN! 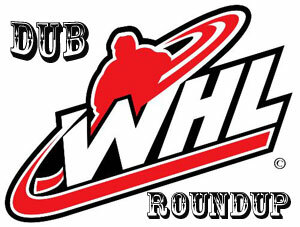 DUB ROUND-UP, WARRIORS WIN AGAIN! CALGARY - Jake Kryski scored twice before setting up Kaden Elder's winner at 2:30 of overtime as the Calgary Hitmen edged the Edmonton Oil Kings 4-3 on Saturday in Western Hockey League action. Bryce Bader also scored for the Hitmen (11-14-3), who dealt Edmonton its fifth loss in a row. Brett Kemp, Quinn Benjafield and Trey Fix-Wolansky found the back of the net for the Oil Kings (14-11-5). Jack McNaughton made 26 saves for Calgary as Todd Scott turned aside 27 shots for Edmonton. The Hitmen went 1 for 3 on the power play while the Oil Kings went 0 for 3 with the man advantage. RED DEER, Alta. - Jett Woo scored the eventual winner at 4:33 of the second and Tristan Langan set up all three of his team's goals as Moose Jaw slipped past the Rebels. Daemon Hunt and Tate Popple also scored for the Warriors (15-5-4), who are 9-0-1 in their last 10. Adam Evanoff only had to make 16 saves for the victory. Byron Fancy gave his club a chance with 43 saves while Brandon Hagel and Zak Smith scored for Red Deer (17-9-1). SWIFT CURRENT, Sask. - Linden McCorrister had a hat trick as Brandon beat the Broncos for its third straight win. Stelio Mattheos and Ridly Greig also scored for the Wheat Kings (13-7-6). Jiri Patera made 31 saves for the victory. Swift Current (4-21-2) got goals from Joona Kiviniemi and Andrew Fyten. Joel Hofer kicked out 30 shots in defeat. MEDICINE HAT, Alta. - Reece Klassen made 31 saves as Lethbridge toppled the Tigers. Jake Leschyshyn, Jordy Bellerive and Dylan Cozens scored for the Hurricanes (13-8-5). James Hamblin replied for Medicine Hat (12-13-3). Mads Sogaard made 23 saves and picked up an assist in the loss. KAMLOOPS, B.C. - Orrin Centazzo had two goals and an assist as the Blazers doubled up Seattle. Zane Franklin, Jermaine Loewen, Quinn Schmiemann and Kobe Mohr also scored for Kamloops (11-11-2), which got 26 saves from Dylan Garand. Tyler Carpendale, Andrej Kukuca and Nolan Volcan scored for the Thunderbirds (9-13-3). Liam Hughes stopped 30-of-35 shots in a losing cause. KELOWNA, B.C. - Dawson Davidson scored his second of the night 23 seconds into overtime as Saskatoon slipped past the Rockets. Gary Haden, Tristen Robins and Brandon Schuldhaus also scored for the Blades (17-9-3). Nolan Maier kicked out 29 shots for the win. Mark Liwiski, Leif Mattson, Braydyn Chizen and Kyle Topping had goals for Kelowna (12-15-2). James Porter combined with Roman Basran for 30 saves, with Basran taking the loss in relief. PORTLAND, Ore. - Ryan Hughes scored twice and Cody Glass had three assists as the Winterhawks toppled Spokane. Jake Gricius, Lane Gilliss, Joachim Blichfeld, Jaydon Dureau, Seth Jarvis and Reece Newkirk also scored and Shane Farkas made 18 saves for Portland (15-10-2). Filip Kral and Jake McGrew found the back of the net for the Chiefs (14-9-4). Dawson Weatherill allowed three goals on 15 shots in a period of work to take the loss. PRINCE GEORGE, B.C. - Dante Hannoun and Igor Martynov had a pair of goals each as Victoria beat the Cougars to snap a three-game slide. Tanner Sidaway also scored for the Royals (13-9-0) while Brock Gould made 18 saves for the win. Ilijah Colina hit the scoresheet for Prince George (10-14-3), losers of four in a row. Taylor Gauthier made 21 saves in defeat. LANGLEY, B.C. - Dawson Holt had a goal and an assist and David Tendeck made 24 saves as Vancouver beat Tri-City for its fifth straight victory. Milos Roman, Evan Patrician, Brayden Watts and Bowen Byram also scored for the Giants (19-6-2). Isaac Johnson and Parker AuCoin responded for the Americans (14-10-1). Beck Warm took the loss with 32 saves. EVERETT, Wash. - Max Palaga made 36 saves as the Silvertips blanked Kootenay to improve to 7-0-1 in its last eight outings. Luke Ormsby, Bryce Kindopp and Gianni Fairbrother supplied the goals for Everett (22-7-1). Jesse Makaj turned aside 42 shots for the Ice (7-19-4), who are on an eight-game slide.